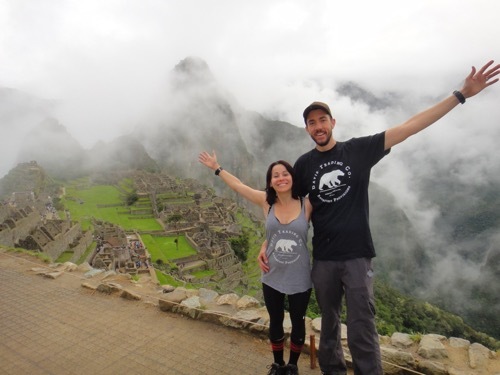 When we first drew up our bucket lists for places in the world we wanted to see, Victoria was excited that I wanted to see Machu Picchu, one of the seven wonders of the world. 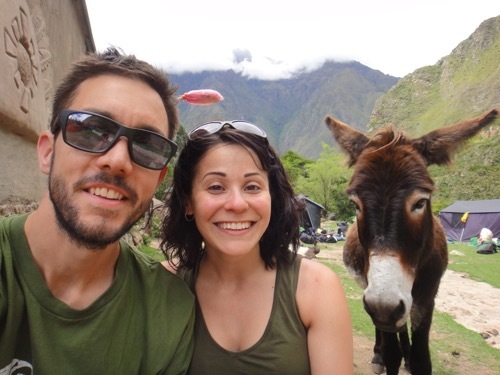 She was less excited when she learned that I wanted to enter Machu Picchu via the Inca Trail. As some of you may know, I’m the hiker in our family, and Victoria is my occasional hesitant hiking partner. I was at first worried about the journey ahead of us, but I would soon learn that whenever Victoria puts her mind to something (even hiking!) nothing will stop her. Our day began with a 5am wake up and bus ride to Ollantaytambo, where we fuelled up with some breakfast and a quick stop at the last real toilet we would see in several days. 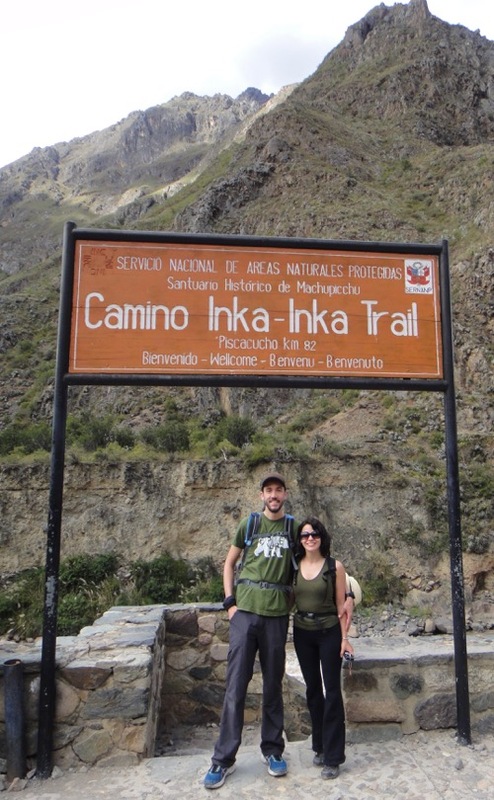 After our pitstop we made our way to kilometre 82, the starting point for the Inca Trail. The trail immediately took off uphill, and both Victoria and I were feeling the altitude. 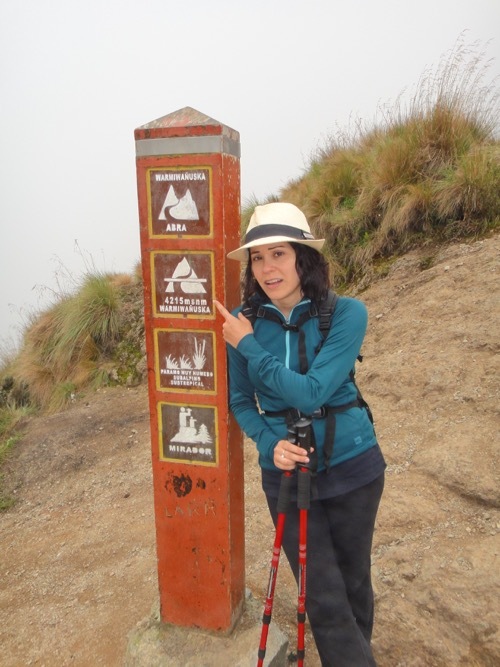 Despite the start of the trail being 600m lower than Cusco, we were definitely huffing and puffing. At our first rest point there were locals selling water, gatorade, beer, and ice cream. It was during this stop that the clip for the waist belt for my pack broke. We were barely 2km in and already some of my gear had failed. I was able to tie the two pieces together, so while not perfect, it was at least not hopeless. Our first stop along the trail was Patallacta, a small city containing temples, a waypoint for Chaskis/Chasquis(messengers of the Incan empire), and terraces for agriculture. 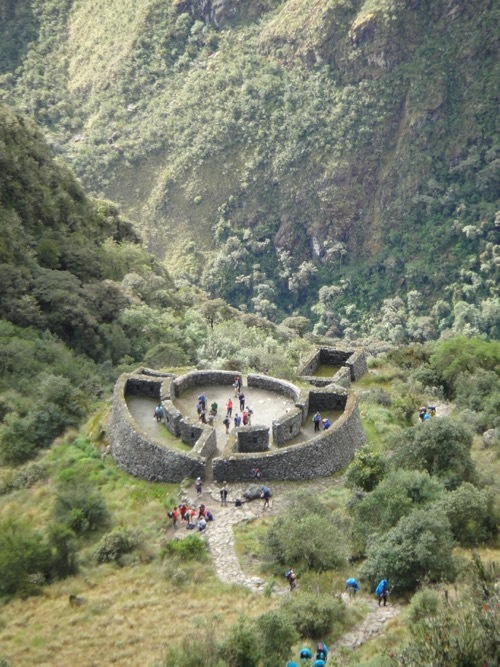 It was our first real taste of an Incan ruin along the trail (though there would be many more), so it was an interesting rest point. Afterwards we stopped for lunch and a short rest in the sun. Here we were joined by some of the locals selling water, beer, and gatorade, and kept company by their friendly mules. The mules would be a common sight along the trail for the first day and a half (as would their poop). 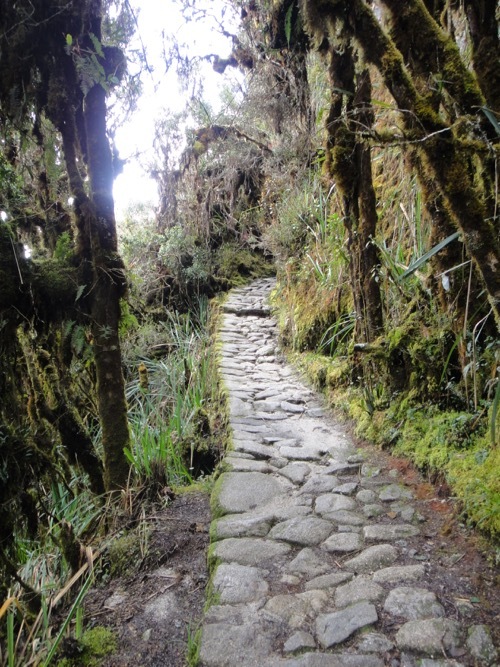 The part of the trail we were on was not restricted to hikers as it was only 60% original Inca Trail, but we would soon find the real deal. 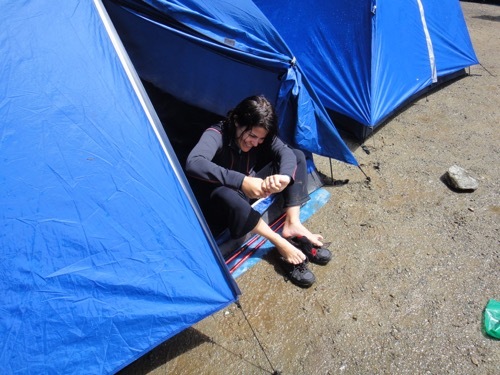 During lunch, we got a short rain shower, but we were in our lunch tent, so all was well. Victoria had been wishing earlier in the day for a bit of rain (a wish she would later regret), so she was happy for a bit of a cool down. After lunch we continued upwards to our first camping spot, Wayllabamba. The porters (a.k.a. heroes) had run ahead of us after lunch to set up our tents and start preparing our dinner. Even though we had had a rough first day, it was difficult not to feel lazy watching these guys in action. After breaking camp, we set off for our most difficult day of the trip. 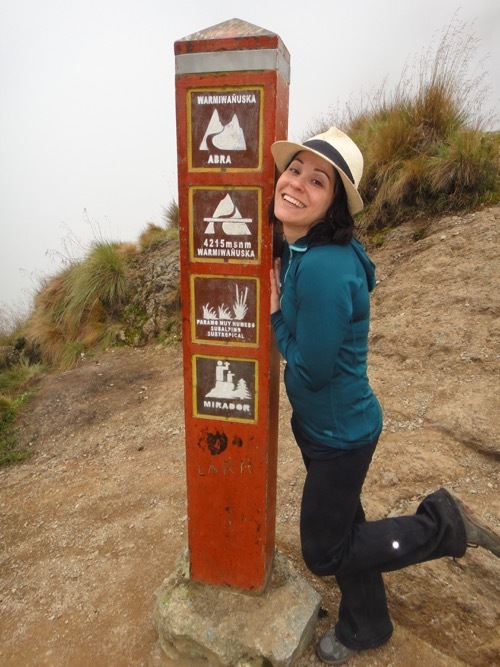 A 1300m climb up to the highest pass on the trail, named Warmiwañiusca or Dead Woman’s Pass at an altitude of 4200m. Once again the porters were off ahead of us, sometimes running up and down the trails. After a deceivingly easy stretch, the trail took a decidedly upwards trajectory, and we were once again struggling for breath. Victoria, who is usually the sprinter out of the two of us, soon learned to pick a slow and steady pace, and kept at it all the way to the top. It only took us a few minutes to catch our breath, after which we were both excited that we had completed the most difficult part of the trip. We couldn’t celebrate for long however, as it was quite cold at the top, and eventually the clouds that had been threatening rain all day finally decided to make good. We were soon descending the other side of the pass in pouring rain. Despite our ponchos, rain jackets, and waterproof shoes, we both ended up with soaking wet pants, which allowed water to make its way into our shoes. By the time we made it to camp at Pacaymayo, we were drenched. Luckily it wasn’t too long before the sun came out, and we were able to wring out our socks. While we could dry our clothes, our shoes were another matter. 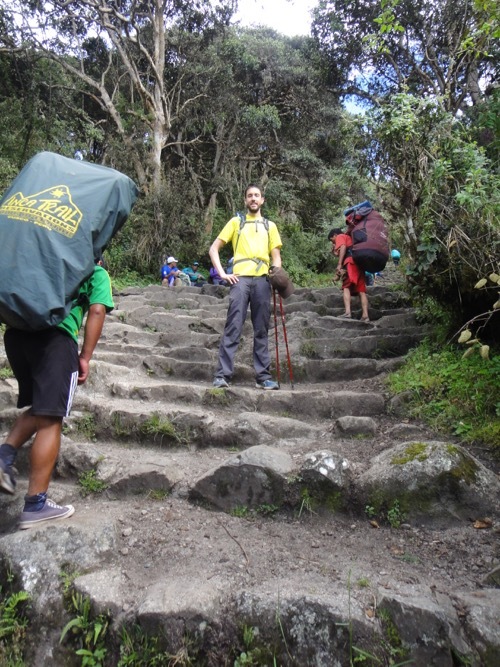 The porters came to our rescue again, taking our sopping wet shoes and placing them by the cooking stove. By the next morning they were dry enough to put on without feeling like we were walking in a marsh. Shortly before the pass, we stopped at Runkurakay. Our guide told us this was another waypoint along the trail, as well as a checkpoint. From this vantage point you could see all people travelling the trail from the pass the day before. After the stop at Runkurakay, it was more up hill to our second big pass. At the top our guide instructed us in avceremony in which we gave thanks to the mountains, shared a quiet moment, and and some rum. It was definitely a ceremony I could get behind. As the sun was shining, we were all glad to take a moment to appreciate the land around us, and of course, catch our breath. 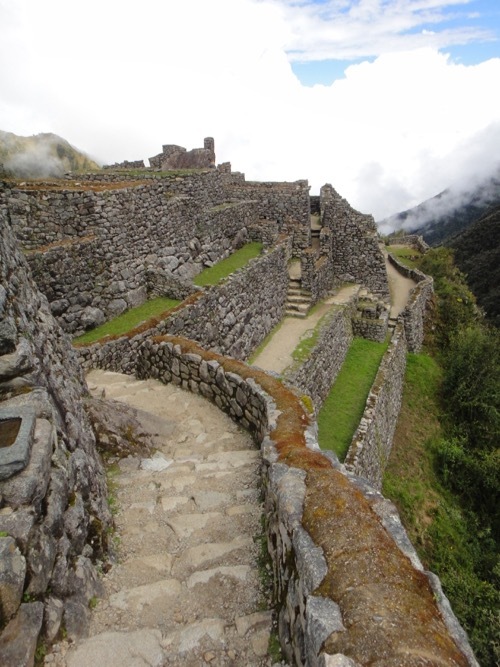 On the other side of the pass we encountered the Inca citadel of Sayacmarca. Here our guide showed us where the King would stay when he was travelling the trail, and where the priests would conduct their ceremonies. The construction was quite impressive, especially considering it was so far into the mountains. 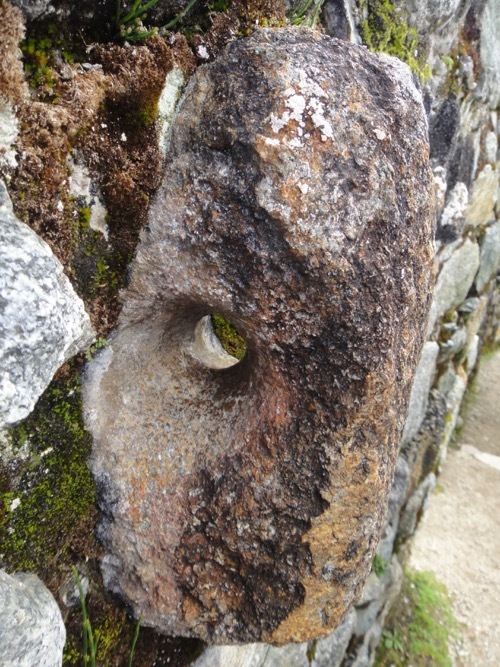 Here we saw channels for aqueducts, and holes carved through stone for attaching curtains. After that it was on to our camp near another Incan ruin: Puya Patamarka. We were able to drop all our gear in our tents before heading down to take a look. 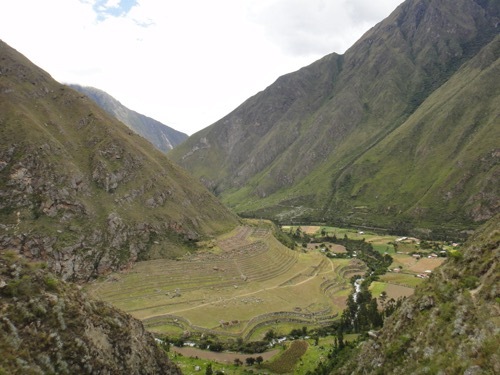 This area, also known as “cloud-level town” was another waypoint along the trail, with many terraces for agriculture. Our guide gave us an overview of the ruin, and we made our way back to camp just as it was starting to rain. 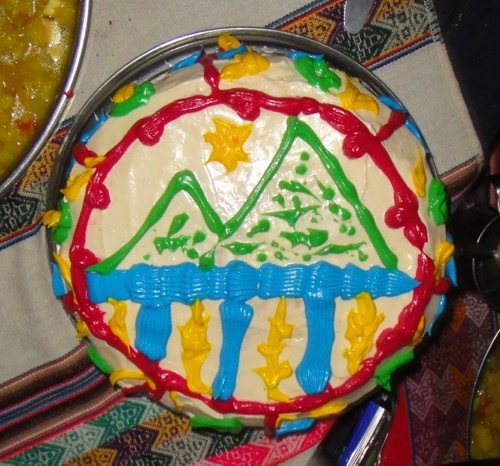 After a bit of a nap, the cooks treated us to another delicious dinner, followed by a cake for a celebration of our final night on the trail. The cynical side of me thinks it also might have been to butter us up for tips, and make us forget the 2:30am wake-up call we would have the next morning. If you can even call it Day Four, started at 2:30am. 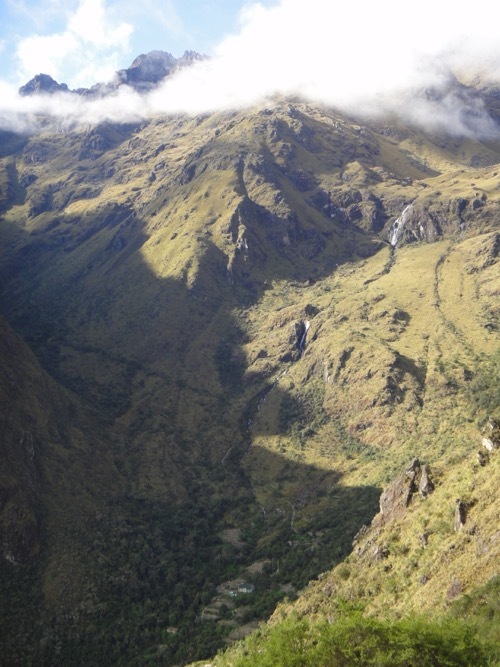 This was both so we could get first view of Machu Picchu, and also so the porters could catch the early train home! Despite our hopes, the rain had not stopped overnight, and we started a wet descent into Machu Picchu with our headlamps and ponchos. Today we would be losing about 1300m in altitude. 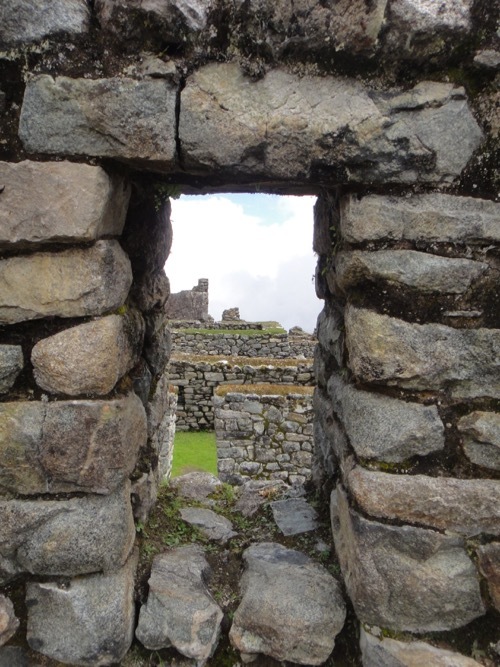 As we slogged on, we were motivated by one thing: reaching the sun gate and getting an amazing view of Machu Picchu. 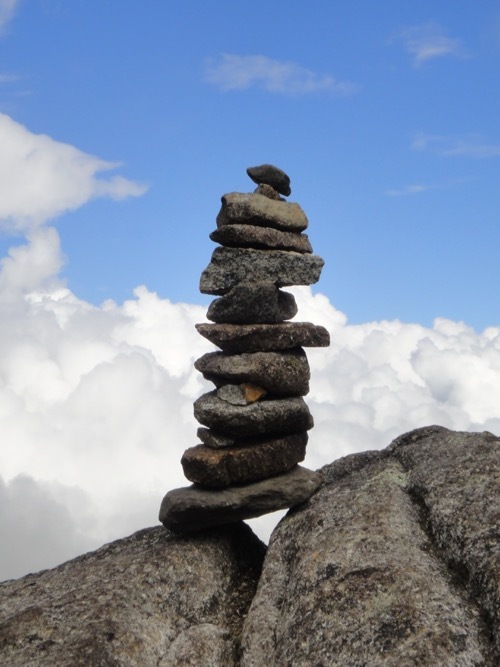 Unfortunately, when we did reach the point where most people can get their first view of the Incan city, all we saw was cloud. By this point we were just too tired to care, and continued on to the city itself. We reached the entrance to Machu Picchu wet, sweaty, and tired. but were rewarded with a break in the clouds long enough to get a good view. 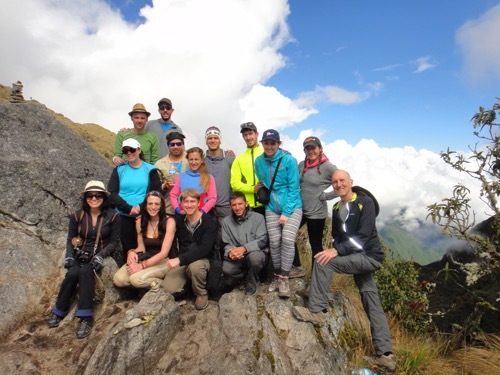 While it was not easy, we definitely earned our triumphant pose in front of Machu Picchu, a view we won’t forget. 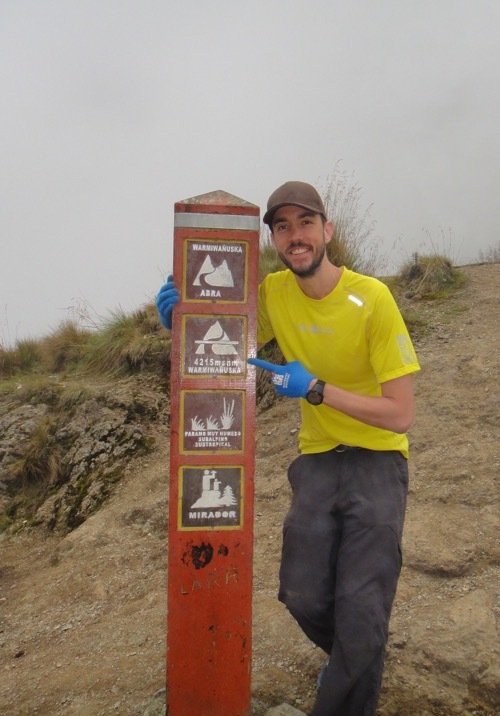 Glad to see that the BMO gloves and race t-shirt made it onto the Inca trail. Looks absolutely amazing.